Willian has taken a major dig at Antonio Conte following Chelsea’s FA Cup final win over Manchester United. The Blues triumphed over the Red Devils in the cup final on Saturday, thereby adding a trophy to their cabinet in what has otherwise been an extremely underwhelming campaign. However, it remains to be seen whether this victory is enough for Antonio Conte to hold onto the job, with sources in England having claimed that the London outfit is already looking for new managerial candidates. While a portion of Chelsea supporters would love to see the Italian stay put at the helm of their club, one particular player who might not be a fan of the idea is none other than Willian. The Brazilian, who has been in and out of the Chelsea starting lineup all season, doesn’t seem content with the current management at Stamford Bridge, as evident from his recent interview. But if these comments weren’t enough indication, the 29-year-old has now taken a major dig at the tactician via his latest post on social media site Instagram, which proves that things are far from alright between the two. 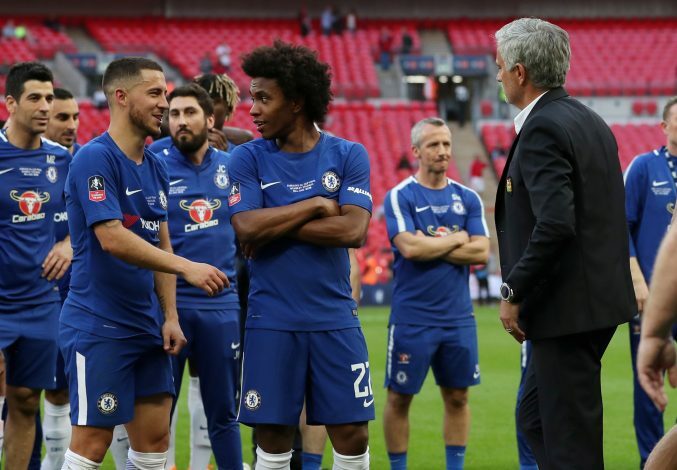 In his Instagram story, Willian posted a picture of the entire Chelsea team as well as the backroom staff celebrating the FA Cup title win at Wembley, but the forward purposely covered Conte up with trophy emoticons in order to keep him from being visible. This move all but proves that Willian has followed the footsteps of Diego Costa and David Luiz – two players who also fell out with Conte since his arrival at the Premier League club. Moreover, it appears very likely that only one of these two figures might end up staying at the club post-summer, meaning that if Conte retains his managerial post at Chelsea, Willian would undoubtedly depart, which could pave the way for a controversial move to his biggest admirers, Jose Mourinho’s Manchester United.